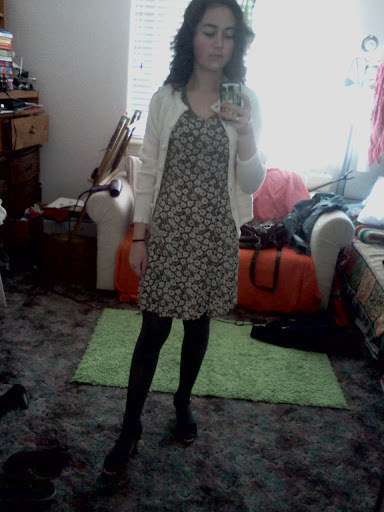 So, I bought this dress from the Christian thrift shop near my house like a million years ago. 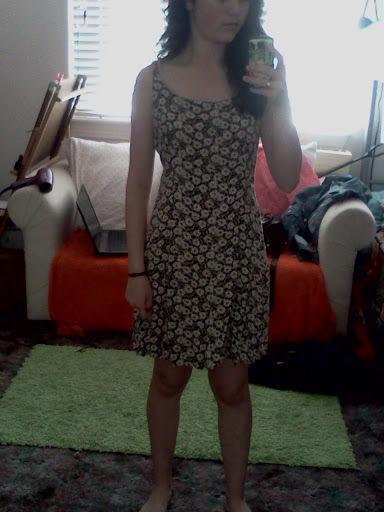 I happen to love floral as long as it’s not too girly or kiddish, so when I found this dress I fell in love. The length was just not working with me. A little too much skin for my personal taste. Everyone has their own opinion on how low, high, revealing, etc they will go. And it also tends to depend on their body shape . . or the weather. But anyway, for moi. 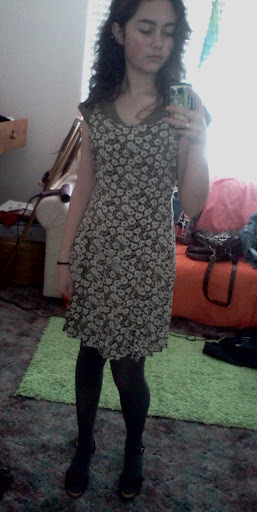 I needed to do something before I could go out in this, because right now, it just looked like a nightgown. And it was kinda cold outside. 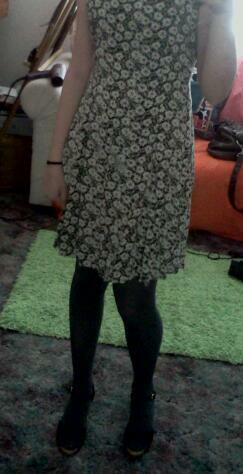 I love nylons or tights with short dresses. They’re also good for girls who maybe play rough or are clumsy (like me) and are always bruising their shins. Or for a lazy no-shave day, perfect for winter. For shoes, I wore strappy black heels. Huh, it’s kind of funny how your tastes change in a short amount of time (I actually took these pictures months ago – you can tell from the old house – and somehow I THOUGHT I already posted on them, but I guess didn’t). 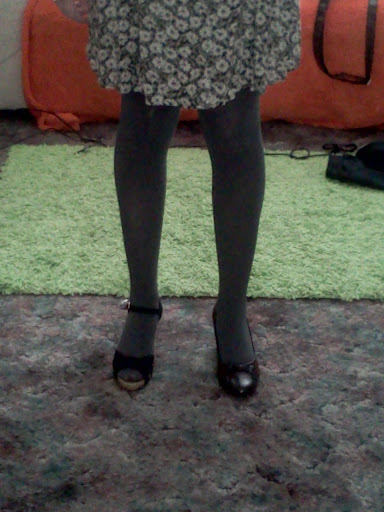 But anyway, if I was choosing today, I think I would’ve picked the ballet heels instead. Though, back then, my reasoning was that I didn’t want to draw too much attention to the shoes. Given the choice, which would you pick? Hehe, I just realized I’ve been naming off body parts in all my captions. . . Hate to stop now I guess. The color of this v-neck matched the dress so perfectly I just had to try it on. I also needed some extra layer on top since the dress is such a soft thin cotton it tends to slide down. But it gave the dress too much of a casual feel that it clashed with the heels. . It was too cold for a tank top, though. (Kind of depressing too, because I have a real nice creme colored one that would’ve worked nicely.) But, I moved on to the next best thing for a strap or sleeveless dress: dee cardigaan. I know this looks like your grandma’s sweater but keep an open mind now. So when it comes to clothes from generations past, always, always, always keep an open mind. Young people + old clothes = style. I am very sure of this. 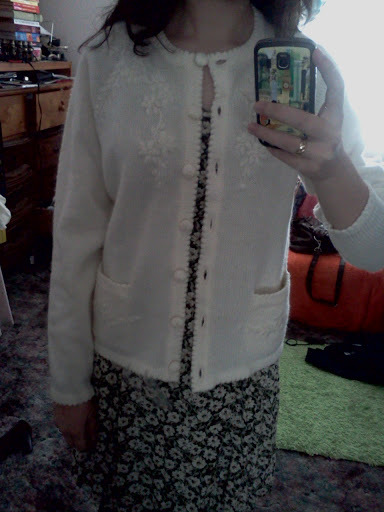 Because whenever I wear my grandma’s clothes I always get compliments (bam. I just made a little intro and cliff-hanger to my post for next week, pretty smooth, eh?). With that cardigan, all I had to do was adjust it a little in the front and I tugged the sleeves up my arms, then ended up rolling them for a neater look. You can tell I’m still wearing the v-neck underneath (for that added modesty layer), but instead of the casual look, the cardigan borders the shirt perfectly, making it look like it belongs and maybe even looks like a part of the dress.